Some of this blog’s readers will no doubt remember that I have previously recommend articles by Shawn Mathis, Pastor of Providence Presbyterian Church in Denver, Colorado. I recommended “What Is a Family Integrated Church?” here. 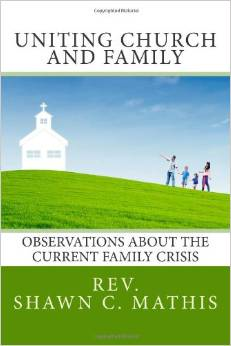 And I recommended “Why I Cannot Sign the Family Integrated Church Confession” here. But more recently Shawn has published an eight part series of articles entitled “Pastoral Evaluation of the Family Integrated Church Movement.” Following are the links to all eight articles, together with a brief description of each one. Part Six expresses his concern for the way that the God-given authority of parents — particularly fathers — tends to overthrow the God-given authority of pastors and churches in the FICM. He also affirms some of the positive things we can learn from the FICM, not wishing to minimize their good concerns and contributions while dealing with their errors. Part Eight offers advice for “working with FIC members in a non-FIC church” and discusses a few of his own personal experiences dealing with those who are a part of the movement. He also outlines where the FICM seems to be heading at present. I think Shawn has done a very good job of describing the FICM and reacting to it in a Biblical manor, and I highly recommend reading his series, which is actually taken from his lecture notes from the Spring 2014 Presbytery of the Midwest Seminar. You can listen to the audio of this seminar, together with the audio for the question and answer session, here. I also recommend reading Shawn’s recent book, Uniting Church and Family, which is primarily a digest of his many past blog posts and internet articles and which gets into much more detail. On another note, I have recently called upon Scott Brown, the Director of the National center for Family Integrated Churches, to respond to my Biblical arguments in support of age segregated education in the churches (here). I now call upon him to respond to Shawn’s work as well. Although my work comes from a Reformed Baptist perspective and Shawn’s comes from a Presbyterian perspective, I think our Biblical and theological arguments overlap nicely for the most part, and I think that they warrant a response. As I pointed out in my previous article, Scott Brown has stated that he has “heard dozens of arguments for age segregation that are not based upon the Bible, but none that are grounded upon the Bible.” However, since both Shawn and I have offered such Biblically grounded arguments, I think it behooves him either to show that our arguments clearly are not Biblical or to revise his statements. Check out their new changes of the confession and organization of NCFIC from their latest blog posting. When my church talked with Reformation OPC (which has since taken its name down), their pastor told us that Mr. Brown was open to changing the confession (this was over a year ago). One of our elders had a list of problems and concerns and clarifications for their confession and was willing to discuss it with Mr. Brown & Co. Reformation's pastor said he could meet with our elder and even seek to arrange a meeting with Brown & Co. My elder followed up two more times on this offer to no avail. Who will help re-write the confession? Will it be a secret committee? Will it include people he has befriended enough to speak at his conference? Or will it include people who genuinely understand Brown's system but disagree? Will the confession be transparent enough to see Brown's “regulative principle of discipleship” or just hide it? Will Brown & Co. recant? The problems with the NCFIC is that they make a preferential issue a theological issue through misinterpreted scriptures. While they teach 'father leadership' they seem to end up with a strong, over controlling leader who dictates to families what is to be taught with emphasis based on their current hobby horse. They drive out those who will not submit and attract those attracted to an outward form of Christianity. The families become preoccupied with outward forms of obedience applied to clothing, schooling, entertainment, etcetera rather than the inward transformation that the Holy Spirit works. Although there are many extreme types like those you have mentioned, in my experience what you have described has been the minority. Most whom I have met, including a number of families at an NCFIC conference that I attended, are well-intentioned and desirous of following Scripture faithfully, but they have over-reacted to some of the negative things associated with many instances of modern age segregated ministry and have been led astray into a legalistic misunderstanding of Scripture as a result. The series I have written here is primarily for them, since I doubt the more radical types you refer to will listen anyway.